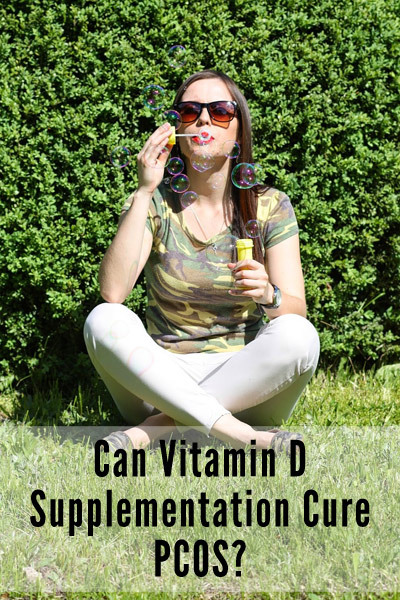 PCOS and Vitamin D Deficiency: Can Supplementation Help Cure You? There is a very strong relationship between PCOS and vitamin D deficiency. PCOS and Vitamin D: What’s the link? Women who have PCOS are three times more likely to be severely deficient in vitamin D (less than 25 nmol/liter in the blood) than those who do not have PCOS. A deficiency in vitamin D for women with PCOS is also associated with insulin resistance, obesity, inflammation (elevated levels of C-reactive protein in the blood), low levels of good cholesterol, and high levels of testosterone. It is, in short, associated with cysts on the ovaries, poor metabolic health, and inflammation. PCOS and Vitamin D: What’s it do? Vitamin D plays a role with hormones in their receptor sites. Without vitamin D, hormones cannot function the way they would normally. The receptor sites malfunction, leaving estrogen, progesterone, testosterone, luteneizing hormone, and follicle stimulating hormone in the lurch. Without healthy action at receptor sites, hormones don’t get utilized. The menstrual cycle fails as a result. PCOS results. Many other hormone problems and symptoms such as acne, facial hair, low libido, mood disturbances, irregular periods and infertility can result. Vitamin D appears to play a real and important role in healthy hormonal and reproductive health. PCOS and vitamin D: Does supplementing with D alleviate PCOS? One meta review study of vitamin D in PCOS patients found that supplementing with vitamin D alone, generally speaking, does not alleviate PCOS. Now this does not mean that the vitamin D supplementation will not helpful for some of the women. Nor does it mean that vitamin D fails to play a causal role in PCOS. What could have happened in this study was that – for these women, and which likely happens for many women – was that vitamin D was important for overcoming their PCOS — but because these women also had many other health issues like insulin resistance and inflammation which require more than just vitamin D to be overcome, such as a highly nutritious, anti-inflammatory diet like the paleo diet, they could not overcome their PCOS with just vitamin D.
No studies have been conducted on the use of vitamin D in the context of a healthy diet and lifestyle. I imagine, however, that it would be quite successful. But perhaps there is another way? Is there a smarter way of overcoming PCOS with vitamin D? Vitamin D is crucial for helping hormones perform their designated tasks. It is necessary, for example, for estrogen to be able to stimulate the right kind of growth in reproductive follicles throughout the menstrual cycle. But once this stimulation happens, the follicles actually need to grow. The element that is most helpful for this growth is calcium. In one study, 100 infertile women with PCOS (83 percent of whom were deficient in vitamin D and 35 percent were ‘severely deficient’) were randomly assigned a group. Group I was treated with metformin. Group II was treated with metformin, vitamin D, and calcium. Both for six months. In the group given vitamin D and calcium, BMI decreased, menstrual regularity increased, follicle health and maturation increased, and fertility increased. In essence, the PCOS was significantly alleviated. Another study measured precisely the amount of follicles developed. The number of dominant follicles (> or = 14 mm) during the 2-3 months of follow-up was higher in the calcium-vitamin D plus metformin group than in either of the other two groups (p = 0.03). Now, both of these groups had women on metformin (read more about metformin and PCOS here). Metformin is a drug that acts to decrease blood sugar and insulin levels. This really helps women with PCOS, especially type I PCOS (you can read more about the different types of PCOS and which one you might have here). Metformin is helpful, but the real efficaciousness of vitamin D and calcium in these studies cannot be overstated: it is only in studies in which both vitamin D and calcium are utilized that follicle volume and strength increases. The hormone-stimulating effects of vitamin D and the activation-effects of calcium work together to help with PCOS. Does this effect work without metformin? In this study, calcium and vitamin D supplementation decreased inflammation and biomarkers of oxidative stress among vitamin D deficient women with PCOS. It was a randomized, double-blind placebo-controlled clinical trial. 104 women with PCOS who were deficient in vitamin D participated. They were randomly divided into four groups which each received different amounts of vitamin D and calcium over the course of eight weeks. After eight weeks, those who took both calcium and vitamin D supplements had far and away the best beta-cell function (a marker of immune system health), lower levels of inflammatory markers, and significant increases in the body’s antioxidant and detox capacities (measured by antioxidant TAC and glutathione levels) of all groups. Women who took just calcium or just vitamin D fared decently, but without significant improvements. Women in the placebo groups experienced no significant change or help at all. First of all, if you have PCOS, it’s probably worth checking out the manual I use with my clients to overcome their PCOS. You can read all about it and see if it’s worth your thought and time at this link: http://paleoforwomen.com/pcos-unlocked-the-manual. Second, if you have PCOS, there is a very good chance that you are deficient in vitamin D, and quite likely even categorized as “severely deficient” in vitamin D.
The best way to get vitamin D is natural absorption from the sun. Daily exposure of at least 20 minutes of noontime sun on bare, SPF-free skin is best. If you cannot do this for any reason (I certainly cannot – because I work and because it’s usually cloudy where I live), you may wish to supplement like I do. I take 1000 IU of vitamin D daily. It’s probably best to take more. I simply take so little because my body is so sensitive. Most medical professionals recommend 1000 IUs per 25 lbs of body weight per day. It’s best to take an emulsified form of vitamin D, which makes it more absorbable. This is the variety of vitamin D that I take. You can get it on Amazon here. Vitamin D by itself will in all likelihood help improve many of your markers of poor metabolism and inflammation. Adding calcium can help resolve PCOS. An organic, or chelated, variety of calcium is probably best. This is an excellent supplement, available on Amazon here. Take the recommended dose for your body size. You can also of course get calcium from your diet. Dark, leafy green vegetables are great sources of calcium (and may be why women who supplemented with vitamin D alone didn’t improve… if they had poor diets they may have lacked the necessary calcium). To that end, two-three servings a day for women with PCOS can go a long way. Dairy products are also high in calcium, but not as much as leafy greens. Because dairy is often a problem for women with PCOS and PCOS symptoms, leafy greens may be the best bet for meeting your calcium needs. Yet bone broth and gelatin are the two best natural sources of calcium. This is an excellent recipe for bone broth. Here is a “paleo snack” version of bone broth – pre made! – from Amazon. And here on Amazon is my favored paleo, grass-fed gelatin. Add it to any liquid (it will be completely flavorless and unnoticeable) daily for a hefty dose of healthy amino acids and other important minerals like calcium. I do one teaspoon daily. And that’s it! What do you think? Does this jive with your experience? How do you meet your vitamin D or calcium needs? Hello!how do you know that you are sensitive to Vit D? What are the symptoms? Thank you! Umm, taking vitamin D may lead to (temporary) high blood pressure in the eyes — even amounts like 1000 – 5000 IU per day can be too much, either with or without proper calcium supplementation. Some (of course, not all) people can’t process vitamin D supplements well, that is, both dry and oil-based may be a problem. It’s potentially related to a genetic malfunction (SNP). So be careful and be aware that it’s a possible side effect!! !